Poured into pint glass golden amber with a nice one finger white head. Very good lacing all the way down the glass. Smell is a nice light floral hops scent. Very faint for a apa. The taste is a light hop bite with a malted balance. Flavor isn't too strong, but it's not missing either. Overall, this is a very good average APA that I think the average non-BA beer drinker will like alot. I would have no problem ordering this at a bar if offered. Had this on tap at McCray's Tavern in Lawrenceville Ga.
To say the least, this was real different. I have NEVER seen a beer that poured this cloudy. I kept waiting for everything to settle so that I would see something different than the almost milk shake look it had. It was peach in color and looked kind of like a melted creamsickle. It did pour a nice less than pure white head that had decent to good retention and some good side lacing. Smell was kind of average, some citrus orange malts showed up along with and some faint hops. It was creamy and the citrus could be picked up in the taste. Surprisingly with the citrus character there was no tartness. More sweet, not bitter or dry. Wow! Widmer has done it again! This is by far the best IPA I have tried in a while. Upon first pour I noticed it smelled sweeter than average IPA. It poured a nice golden color, has minimal foam and carbonation. It has a sweeter taste and great aroma. This is a superb beer. 22oz glass of dark red goodness. Almost no head but a good ring around the glass makes me think it was just the pour. The aroma has a solid amount of caramel and sourdough but that is dominated by a large amount of orange citrus and grapefruit. I was expecting more malt in the flavor but I was overwhelmed with fruity hop flavors. A ton of grapefruit and orange, like the nose, but with a tasty combination of malt and hops that is fruity, tangy and sweet. This went down very smooth because of how tasty it was. Medium/light body with a juicy, thirst quenching finish. Appearance - Clear copper colour with a large size frothy off white coloured head. There is a low amount of carbonation and there is some good lacing. The head lasted for over 5 minutes before it was gone. 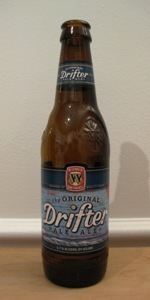 Taste & Mouth - There is an average amount of carbonation and the taste is made up of caramel and malts mixed with hops. It also has a bit of a sugary apricot flavour with a hint of pineapple and some grapefruit. It ends with a caramel/malty aftertaste with a some bittersweet notes. Overall - A nice well balanced very drinkable pale ale. The flavours are fairly subdued, but they are good. I wouldn't pick this one up again, but I wouldn't turn it away if offered. There are just too many better beers out there. Poured from brown bottle born in mid june. A clear dark amber / orange with thin eggshell head. Smell: bready malt with a piney, lemony, vaguely grapefruity hop character. Taste: sweet bready and caramel malt with a light citrus kick, and a touch of an odd musty astringency. The hop character is fine but the malt is too sweet and a bit funky. A little on the thin side too. Not bad but won't return. Appearance: Pours a wonderful orangish amber with a nice half-inch head with good retention. Smell: Citruses dominate the smell, with just a hint of appealing malt. Taste: Wonderful. A hoppy citrus with just a hint of tropical fruits dominates the start, giving way to a slightly yeasty malt. The aftertaste lingers for a while and is great, with a perfect balance of hops and malts. It's very crisp, and is great in warmer weather. I do sometimes get a bit of a metallic taste which puills this down just a bit. Mouthfeel: Just the right amount of carbonation for the style. Drinkability: Goes down very easy. Could down a few of these no problem. The wonderful after-taste forces me to drink these slowly though. All in all this is an exceptional american pale ale, and it's cheap too! For the 7 bucks a six-pack I can find this for locally, it's a no brainer. It's probably not quite as good as Sierra Nevada, but it's still great if you want a little more citrus in your pale ale. As it is it's a wonderful warm-up beer for a great session. This is a good, yeasty, very drinkable, well-balanced and well-rounded American Pale Ale with hop and malt qualities both quite noticeable. Amber, it has a medium off-white head steadily shrinking to a foamy ring and some frothy lace. Aroma is mandarin orange, a little clearly noticeable but subdued grapefruit, bread, hints of pine resin, yeast, anise, and hay. Taste is a lot of dough, a bit yeasty with light, juicy orange, yeast, hints of dried herbs and hay. It is very balanced in sweetness ans bitterness, hop and malt character, but not weak in any element. It is very drinkable and has a faint, subdued English quality to it. sample bottle. What a surprise after having the amber. This poured a much richer color with a thicker head. I suppose the 5.7% on the front might have something to do with a fuller bodied beer. Nice darker hue than the amber. Goes down smooth and has great balance between hop and malt. It's not the best thing I've ever had, but considering the previous beer I drank, this one is a solid, accessible beer. Pleasantly surprised to find this kind of output from widmer. I poured it from the bottle into my chalice. The head didn't stick around for that long, the beer had a nice clear, slightly ruby hue. The smells were the highlight of the beer for me, without looking i would guess it was some combo of west coast hops. Very nice. The taste was nice because the hops came through initially but it was a surprisingly balanced pale. The nose prepared me for a near ipa style, but it was nice to have the balance between the hops and the malt. The mouthfeel definitely fit the style, and i felt like i could definitly drink a few more of these upon finishing. Spot on widmer...spot on. Poured from 12 oz bottle dated 5-19-11 into a Duvel tulip. A - Having not read that label or knowing anything about the beer, the pour was surprising. Dark amber in color. As the bottle states, "Anything but pale" Lacing is not too apparent, but it rolls around the glass nicely before slowly trickling down back into the main volume of the beer. S - sweet crystal malt and american hops. Not too strong on either one. T - Just about the best tasting APA I've ever had. It is very well if not perfectly balanced. Sweet and caramely up front into a wonderfully grassy hop note. Bitterness was not over the top as I was dreading with most APA's these days. M - Great for the style. closer to medium bodied than light. Great level of carbonation. O - A very surprising beer for me, starting from the pour all the way to the last sips. I was expecting an average overhopped APA, but I thoroughly enjoyed this not so pale pale ale. Pours a deep amber red. Thin head with faint retention. Decent lacing. The nose has a lot going on. Pine, citrus. but mainly a floral aroma. Hits very bright and citrusy. Grapefruit and pineapple are present. Full bodied for the style. Very full finish with nice, nice bitters.